Israel controls every aspect of life in Gaza, but takes no responsibility for the brutal consequences. Three decades of Israeli-imposed closure have wreaked havoc on the Gaza Strip’s infrastructure, natural resources, economy, and, most importantly, its people, who are denied the right to engage in dignified, productive work. Factory equipment and skills atrophy as raw materials are banned, markets are cut off, and power shortages make production too expensive. Universities are isolated from the cosmopolitan exchange that is their lifeblood. High-tech entrepreneurs are constrained by Israeli restrictions on 3G smartphone technology and the inability to meet clients face-to-face. Families are separated. Patients struggle to access adequate care. The Palestinian factional split has exacerbated these ills, as Fatah and Hamas fight over who will pay for services in Gaza, and neither appears responsive to Gaza’s needs. Understanding the “de-development” of Gaza requires a close look at the evolution of Israel’s movement and access policies and what they mean for the Occupied Territories. Undoing the de-development of Gaza requires changing the fundamental principle of those policies, namely, Israel’s closure of borders and repudiation of responsibility for the people trapped inside. And finally, reversing course for Gaza also requires us to re-think the wisdom of interim Palestinian autonomy over local affairs, given the lack of Palestinian control over major aspects of life in both Gaza and the West Bank. In the aftermath of the 1948 War, Gaza, ruled by Egypt, found itself briefly severed from the area of which it had historically been an integral part, as Jordan captured the West Bank and the State of Israel was established. The 1967 Israeli conquest reintegrated Gaza and its residents, most of whom were refugees from what became Israel, into historic Palestine or the Biblical Land of Israel, restoring freedom of movement and facilitating renewal of familial, social, and economic ties. For the first two decades of the occupation, Israeli policy sought to integrate the economies of Gaza, the West Bank, and Israel. 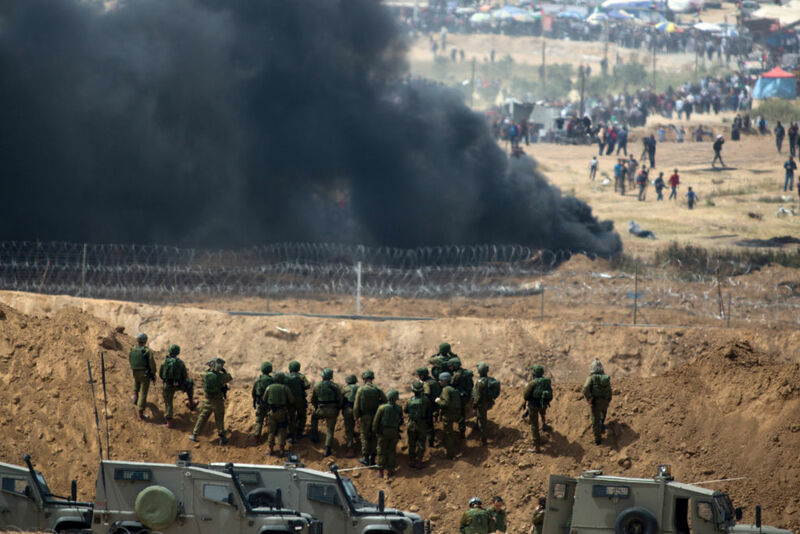 Among the early orders that Israel’s military governments issued were “general exit permits” authorizing Palestinians to travel freely between Gaza, Israel, and the West Bank, unless individually prohibited from doing so. Palestinian workers were encouraged to find jobs in Israel, providing cheap manual labor for Israeli employers and an influx of cash that raised the standard of living in Gaza and the West Bank. Israeli policy toward the Occupied Territories served its own economic and strategic needs but included no real plan for Palestinian economic development beyond increased cash remittances. On the contrary, the Israeli military restricted Palestinian economic activity that was deemed competitive with Israeli businesses, Israeli investors were discouraged from partnering with Palestinian industries, and investment in Palestinian infrastructure and business initiatives was minimal. The outbreak of the first intifada, or uprising, in 1987 called into question the official Israeli hope that Palestinians would suspend their political aspirations in exchange for improvements in their standard of living. The Israeli authorities responded to the violence by tightening limitations on Palestinian movement. Israel’s 1949 armistice lines remained permeable in the outward direction, as Israeli civilians continued to settle the West Bank and Gaza. But the military increasingly prevented Palestinians from entering Israel and East Jerusalem and from crossing between Gaza and the West Bank. In 1991, against the backdrop of the first intifada and the Gulf War, Israel canceled the general exit permits, barring all Palestinians from traveling unless they obtained individual permits to do so. Enforcement was gradual, as the criteria for receiving permits became stricter over time. In 1995, Israel built a fence around Gaza. The percentage of Gaza’s workforce employed in Israel collapsed from a high of 45 percent in the 1980s to 6 percent in 1996. Unemployment in Gaza soared to 30 percent. If the promise of the first two decades of the occupation was integration throughout what had been British Mandate Palestine, the promise of the Oslo Accords was separation from Israel but integration of Gaza and the West Bank, which were recognized as a single territorial unit. Yet the Oslo Accords in fact ushered in more fragmentation. Excepting a brief period between 1999 and 2000, during which a “safe passage” allowed transit for many between Gaza and the West Bank, Gaza became increasingly closed off. With the outbreak of the second intifada in 2000, Israel closed the safe passage as well as the airport in Gaza, and eventually destroyed the site where a seaport was to be built. In 2005, Israel removed its civilian settlers and permanent ground troop presence from Gaza. Asserting that this terminated its responsibility to allow travel to and from the Gaza Strip, Israel further tightened its restrictions on Palestinian movement. In March 2006, Israel stopped allowing workers from Gaza to reach their jobs in Israel. Citing security threats, Israel repeatedly closed Karni crossing — Gaza’s commercial lifeline — during the height of Gaza’s lucrative winter produce season, causing financial losses and undermining the trust of Israeli and West Bank purchasers in suppliers from Gaza. When Hamas took control of the Gaza Strip in June 2007, Israel closed the Karni truck crossing permanently, banning all outgoing goods and permitting only basic humanitarian goods to enter, in a publicly declared effort to cripple Gaza’s economy. Between 2007 and 2010, Israeli policy toward Gaza was explicitly punitive. The Israeli authorities created mathematical formulae to determine how much food to allow into Gaza, based on a count of how many calories they determined that Palestinians in Gaza needed to consume. Margarine in small packets was permitted into Gaza as a basic foodstuff. Margarine in large buckets was banned as an input for the food industry, whose availability would enable factories to produce biscuits and employ workers — contrary to Israel’s stated goal of “economic warfare” (“lohama kalkalit”). Gaza’s GDP plummeted. By 2008, travel through the Erez crossing between Gaza and Israel averaged just over two thousand exits of people per month, compared with more than half a million exits of Palestinians alone in September 2000, on the eve of the second intifada. The 2010 flotilla incident, in which Israeli commandos killed nine Turkish citizens trying to reach Gaza by sea, brought an end to the explicitly punitive aspects of the policy. But the closure remains, now justified by reference to security threats and a claimed lack of obligation to permit more travel, given Israel’s position that it no longer owes duties to Gaza residents under the law of occupation. Beginning in June 2010, Israel eased restrictions on incoming goods to Gaza, although it restricts an ever-growing list of “dual use” goods, including some construction materials and some raw materials for industry, on the grounds that they might be used for military purposes. Some outgoing goods are now permitted, subject to quotas and burdensome logistical arrangements, while travel for people between Gaza, Israel, and the West Bank has been expanded. But, for the most part, Gaza remains closed. Travel via Erez crossing averaged just over thirteen thousand exits per month in 2016, less than 3 percent of the level in September 2000. Although Israel is the largest market for goods from Gaza, Gaza residents may only transfer limited quantities of eggplants, tomatoes, furniture, textiles, and scrap metal to Israeli buyers. The Rafah crossing with Egypt is closed most of the time, reflecting Hamas’s sour relationship with the Egyptian regime. Israel refuses to permit the reopening of the airport or the construction of a seaport. The sweeping nature of the restrictions raises questions about Israel’s stated security rationale. Imagine taking the city of New York and cutting it off from the rest of the United States. Imagine expecting its water supply, electrical production capacity, industries, and institutions to function independently of the rest of the country. The airports and waterways would close. Universities located in New York City would be available to New Yorkers only, and higher education in Long Island, Connecticut, or anywhere else outside the city would be off limits. Whatever water could be obtained from water sources in or under the city would be allocated to city residents; everything else would be purchased through commercial contracts, subject to funding, availability, and willingness to sell. The waste of New York’s 8.5 million residents would be disposed of entirely within city limits. Broadway shows, restaurants, and Fifth Avenue clothing shops would be for residents only. Visiting a daughter in Westchester would be permitted in exceptional humanitarian circumstances only. Under such conditions, even a large, wealthy metropolis like New York would buckle and ultimately break. Palestinians in Gaza, and to a lesser extent the West Bank, face that reality of closure. Although the Palestinian education system was designed to serve all Palestinian students, Israel categorically refuses to allow students from Gaza to study at universities in the West Bank. Although 31 percent of Gaza residents have family in Israel and the West Bank, including East Jerusalem, family visits are permitted for first-degree relatives only in cases of death, grave illness, or weddings. The Israeli authorities ban family reunification inside Israel and the West Bank. Although prior to 2007, 85 percent of Gaza’s outgoing goods were sold in Israel and the West Bank, quotas and restrictions limit transfer of outgoing goods from Gaza to those markets. In 2016, Gaza residents sold just 15 percent of the pre-June 2007 levels of outgoing goods. Access to the sea is limited by Israeli warships that keep fishing vessels within six nautical miles of the coast, while access to a third of Gaza’s arable lands is limited by an Israeli-enforced “no-go” zone on the Gaza side of the border with Israel. Gaza’s unemployment rate is now 42 percent, and nearly 80 percent of Gaza residents are dependent on humanitarian assistance. Although Israel and the Palestine Liberation Organization (PLO) agreed in the Oslo Accords to treat Gaza and the West Bank as a single territorial unit, the accords’ provisions for water use separate the Palestinian water economy in two. The mountain aquifer, which runs under the West Bank and Israel, was designated for Israeli and West Bank use only, with Israel taking 80 percent of the water and Palestinians taking 20 percent. The Gaza Strip was to rely on its coastal aquifer, which is inadequate for the needs of its 1.9 million residents, as well as small quantities purchased from Israel. Over-pumping has salinized the aquifer, rendering 90 percent of Gaza’s water unfit for human consumption. The UN warns that continued over-pumping will cause irreversible damage. Although Israel connected Gaza to its electricity grid in 1970, at least since the Oslo period it has treated Gaza as responsible for its own electricity supply. Gaza receives less than half the electricity it needs, due to bombings of its power plant by the Israeli army, inadequate infrastructure, and funding disputes between the two Palestinian factions over the purchase of industrial diesel from Israel. As of last year, Gaza residents received electricity for three to eight hours per day. Large factories and hospitals have back-up generators, but the power they supply is expensive and unreliable, and the power fluctuations damage medical equipment and limit the procedures that hospitals can conduct. The Gaza Strip is the quintessential canary in the coal mine. The home of 1.3 million refugees from what is now Israel and the epicenter of the first Palestinian uprising, Gaza is the symbol of Palestinian resistance to Israel’s policies of displacement and dispossession. It is also a testing ground for Israel’s responses to that resistance. Repeatedly, Israeli policies restricting Palestinian movement have been pioneered in Gaza and then gradually extended to the West Bank. In 1989, Israel began requiring workers from Gaza to carry magnetic cards as a condition for entering Israel. In 1995, it extended that requirement to workers from the West Bank. In 1993, Israel prohibited Israeli citizens and residents from entering Gaza without a permit. In 2000, it banned Israelis from entering West Bank cities without a permit. In 1995, Israel built a fence around the Gaza Strip, effectively hemming in its residents between the sea, the border with Israel, and the heavily patrolled border with Egypt. In 2002, Israel began building a separation barrier that severs large swaths of the West Bank from other parts of the West Bank and from Israel. The Gaza Strip, together with the West Bank city of Jericho, were the first areas from which Israel withdrew in the context of the Oslo Accords in 1994. The 2005 “disengagement,” after which Israel sealed Gaza’s borders, included the dismantling of four settlements in the northern West Bank, widely seen as a pilot for the removal of additional isolated settlements in favor of reinforcing Israeli claims over the large settlement blocs. In 2007, citing the government’s designation of Gaza as “hostile territory,” Israeli banks severed ties to Palestinian banks in Gaza, refusing to transfer funds to accounts there. In the years since, Israeli banks have repeatedly threatened to sever ties to Palestinian banks in the West Bank, too. These are just some of the indicators that the model Israel has employed for Gaza — withdrawing from the interior of areas where it has abandoned plans to settle its civilians, closing those areas off into an enclave, and disavowing responsibility for what happens inside — could be replicated in the West Bank. This would manifest as continued de facto annexation of Area C (the 60 percent of the West Bank containing Israeli settlements) and disavowal for what happens in the rest of the territory, where Palestinians are concentrated. Palestinians in Gaza are resilient. They have maintained a strong social fabric and entrepreneurial spirit despite the burdens that Israeli and Palestinian leaders have cynically piled upon them. When Israel blocked the entrance of cash into Gaza in 2009, creating a shortage of the half-shekel coins used to pay the 1.5-shekel public taxi fare, drivers gave change in the form of sweets and packets of tissues. In 2008, when Israel blocked the transfer of gas into Gaza beyond what it determined was necessary for “humanitarian” needs, Palestinians in Gaza converted cars, home appliances, and factory equipment to run on whatever source of energy they could find. A friend described entering a public taxi in Gaza during that period of chronic fuel shortages. He turned to the driver, a quizzical expression on his face. “You don’t know?” the driver responded. The driver had converted the engine to run on recycled cooking oil from the falafel shop. Gaza has endured much. But we should stop testing the resilience of its residents. Reversing the de-development of Gaza will require a fundamental shift in approach. Gaza, like the West Bank, cannot function as an enclave, any more than New York City could survive in isolation. The key to reversing course is recognizing the necessity of re-connecting Gaza not just to the West Bank but also to what is now Israel, and allocating to Gaza its fair share of resources from the power that controls its borders. By actively pursuing Palestinian local administration in most of the West Bank and Gaza, in the absence of Palestinian control of borders, the international community, the Palestinian Authority (PA), and Hamas have — perhaps unwittingly — condoned and facilitated the twin tenets of Israel’s occupation policy: separation and repudiation of responsibility for civilian life in the territory Israel occupies. The Oslo interim framework formally exempted Israel from funding the needs of the civilian population it continues to control. Its provisions requiring the PA to pay for health care, education, sewage treatment, and other public services have been extended and endorsed by all parties, including the PA’s Western and Arab donors. Hamas, although self-branded a resistance organization, also assumed responsibility for administering daily life in Gaza, despite its lack of control over critical government functions like the ability to regulate who and what enters and leaves. We owe it to Palestinians — and Israelis — to acknowledge that the framework of Palestinian responsibility without Palestinian control is not working. It is feeding and reinforcing its mirror image: Israeli control without Israeli responsibility. I would suggest to activists and policymakers that we reorder our approach to Gaza and reframe our demands of the Israeli government. Yes, we should continue to oppose the occupation as an inherent suspension of the right to self-determination. But so long as the Israeli government exercises control over Palestinians, it should be accountable for meeting their needs and respecting and promoting their rights, as the law of occupation requires. We should question the framework of Palestinian local autonomy, in which the Palestinian authorities are financially responsible for meeting the needs of Palestinians even though they don’t control their borders or most of the interior of the West Bank. Indeed, the PA’s very ability to operate is predicated on consent from Israel, rendering it acutely vulnerable to Israeli pressure. Should the PA be expected to purchase Gaza’s water and electricity from Israel? Or, given the unsustainable shortages and the fact that the so-called Israeli water supply draws on a shared Israeli-Palestinian water source, should Israel supply it at the same levels allocated to its own residents, charging consumers for use, subject to subsidies for those unable to pay? Why do we accept a differential right to health for Israelis and Palestinians, conditioning Palestinian access to Israeli hospitals on the willingness and ability of the PA to pay for it? Should we continue to affirm the Green Line, the 1949 armistice line between Israel and the Palestinian territory? It is porous in one direction only — for Israeli civilians to move outward to settle land. Could we not demand reciprocity, affirming the right of Palestinians to travel into Israel as well, where they might take advantage of educational and economic opportunities, reunite with family members, and use Ben Gurion Airport to travel abroad? Staking these claims requires neither that we give up on Palestinian autonomy or self-determination, nor that we abandon the demand for Israel to dismantle settlements and terminate its control over Palestinians. But in the context of an indefinite military occupation and “interim arrangements” that persist years past their stated expiration date, we should pay close attention to what is happening to human beings — to an entire society — in the so-called interim. Indeed, requiring Israel to bear the cost of the occupation would also provide Israel with a financial incentive to end it. Of course, there is a tension between fighting for Palestinian independence and demanding Israeli accountability to civilians living under occupation. We do not want a return to the oxymoron of “enlightened occupation.” But I suggest that the balance we are striking now, rooted in the hopes of the 1990s, is anachronistic. So-called Palestinian autonomy over local affairs exempts Israel from responsibility for the devastating consequences of its movement and access policies. Palestinian authorities could continue to participate in local governance, but where resources are inadequate, Israel as the occupying power has an obligation to fill the gap. This would be not unlike a federal system in which local authorities provide services, but the central government retains responsibility for providing a floor of protection and may be required to supplement local budgets to ensure adequate service provision. The closure of Gaza is stifling the beautiful potential of its 1.9 million residents, 54 percent of whom are children and teenagers. Perhaps this generation of young people will succeed, where we have so far failed, and end the occupation. In the meantime, we adults should rededicate ourselves to reopening their closed horizons. Sari Bashi is co-founder and former executive director (2005–2014) of the Israeli human rights organization Gisha — Legal Center for Freedom of Movement.